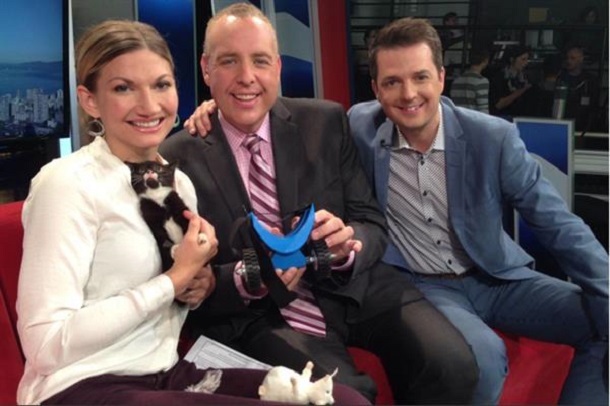 A handicapped kitten was given a new life with a 3D printed wheelchair by two seventeen year old students Isaiah Walker and Josh Messmer from Walnut Grove secondary school, British Columbia. Cassidy is the name of the little kitten, he was found in a dire situation in rural Langley, British Columbia. The black and white kitten lost his both back legs, possibly his mother mistakenly knawing it off instead of the umbilical cord at his birth. The poor kitten was also suffering from E-Coli in the back leg joints. Luckily the kitten was found by Tiny Kittens Society’s owner Shelly Roche, the society is a non-profit organization which is a multi faced, they cater to abandoned cats and kitten by nursing and fostering. They also run round the clock 24×7 kitten web cam which has reached worldwide fame along with a neutering program for stray cats and offer education on pet ownership. Normally cats/kittens found in such dire situations are put down, however, in the case of Cassidy, Roche’s commitment and Cassidy’s will power to be alive made it well together. Cassidy in spite of being in such a dire situation, somehow managed to be alive and he also could take his little bum off the ground and his walking was more like a reverse Velociraptor – until Shelly found him. Roche took a very good care of Cassidy and his health improved, however this little kitten was still trapped because of his handicap situation. Roche disparately wanted to find a solution to Cassidy’s ailing; she unsuccessfully tried with a temporary sling. In order to put Cassidy out of his misery, Roche puts out a call for help on her website so as to any ideas she could get. On hearing the SOS, two secondary school student from Walnut Grove, Isaiah Walker and Josh Messmer responded. The two felt sorry for tiny Cassidy and they set out to create a device to make the kitten move again on its own. Walker and Messmer after many hours of thinking zeroed in to designing a wheelchair using 3D printing. 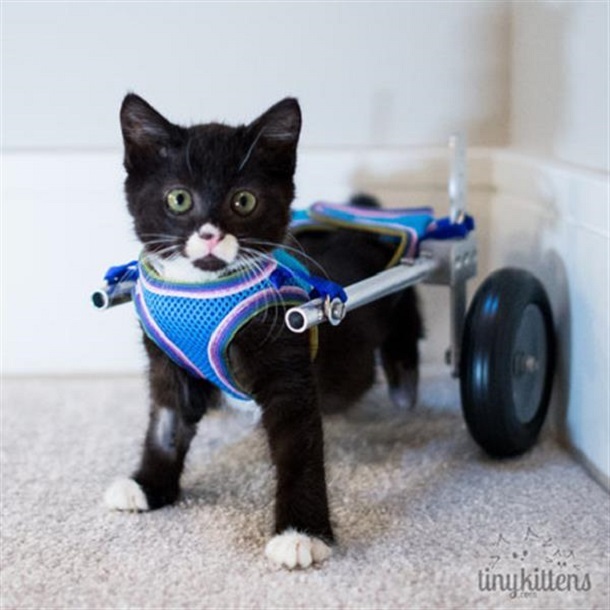 After several iterations the duo came up with 3D printed wheel chairs for tiny Cassidy, on using it tiny kitten was so happy after all he could now move around himself, now he had his freedom. As Cassidy will grow, the wheelchair will continually be improved and modified to fit his growing body. It is heartwarming for us who get entertained from Tinykittens 24×7 to know the promoters are also helping feline friends by going above and beyond in helping. We also expect many more innovative things from the two students who made use of additive 3D printing to give another life to the little kitten.